Taken yesterday at Samphire Hoe, a country park at the foot of the White Cliffs to the west of Dover. The park was created using the spoil of 4.9 million cubic metres of chalk marl from the Channel Tunnel excavations and it opened to the public in 1997. It is named after the rock samphire which was once collected from the local cliffs, pickled in brine and sent to be used in London restaurants. A hoe is a piece of land that juts out from the mainland. The Samphire Tower is a 33 ft high oak and larch clad structure housing a brass telescope which 'acts as an interactive interface, linking the landscape views with audio content allowing visitors to change and modulate the sounds. Pre-recorded digital sound mixes seamlessly with live sounds from shortwave and marine band radio' powered by solar panels mounted on the top of the tower. Just out of sight on the horizon is the English Channel. I love everything about this. The low pov the textures...all of it! Wery well composed and great in b&w. Oh my ... this is just fabulous. 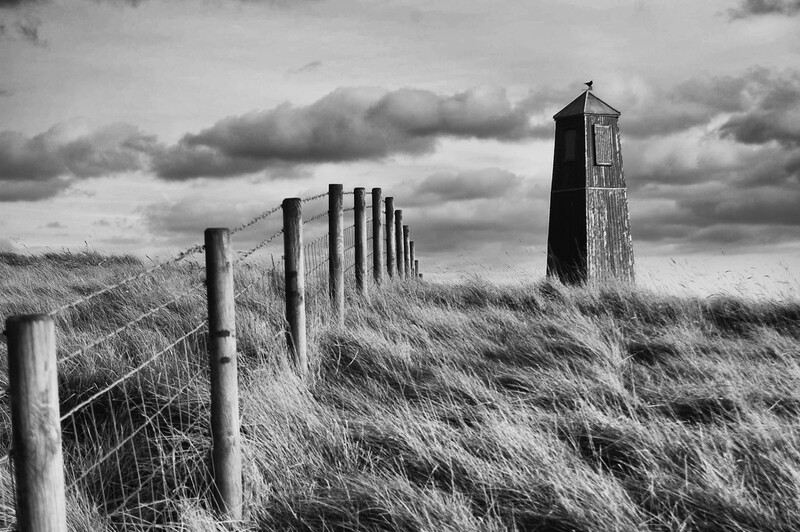 The leading line of the fence, the blowing grasses, the textured tower and the dramatic sky. You got it all, Felicity! Big Fav!! Lovely shot. The fence is a great leading line. Great POV and composition and love the fence leading the eyes in - fav! Great composition. Love the details of the fence and the structure of the tower. I just love this photo - it's so moody and so well composed. That is also fascinating info - thank you so much. A beautiful view and a great B+W capture of it. I love everything about this, especially being b&w. Definitely a fav. Wonderfully composed with beautiful textures. Fabulous image, and even better with the contextual story to accompany it. I really like the composition on this one. Nice use of the fence to draw the eye through the image, the textures of the grass and the building, and the dramatic clouds. Ohhhh... this is fantastic. I love everything about this capture. This needs to be printed out and hung! Huge fave. Loved reading your narrative, fascinated by the idea of the radio crackles and music. What a fabulous composition and so well suited to monochrome. Fav! Great composition, the fence leads my eye straight to the tower and the blowing grass adds interest in the foreground. Looks great in b&w too! This is stunning. Love the fence line and the bleak atmosphere. I can almost feel the wind. Fab composition. oh wow missed this before. just found it at the top of the topmost top spots :) many congrats - a well-deserved winner! @suzanne234 @pistache Thanks so much, it's made my day if not my month!!! Congratulations on this making the top of the TT! It is fabulous! @louannwarren Thanks so much - I was amazed and so happy! Congratulations Felicity for making number 1 on top 20!!! Congrats on TT - and on #! - Wow!! @radiogirl @megpicatilly @365karly1 @casablanca Thank you all so very much - I was shellshocked. Never ever did I expect that!! Congratulations Felicity on your top of the TOP finish! @skipt07 Thanks so much Skip, I was so surprised!! Love this shot. Congrats on TT!